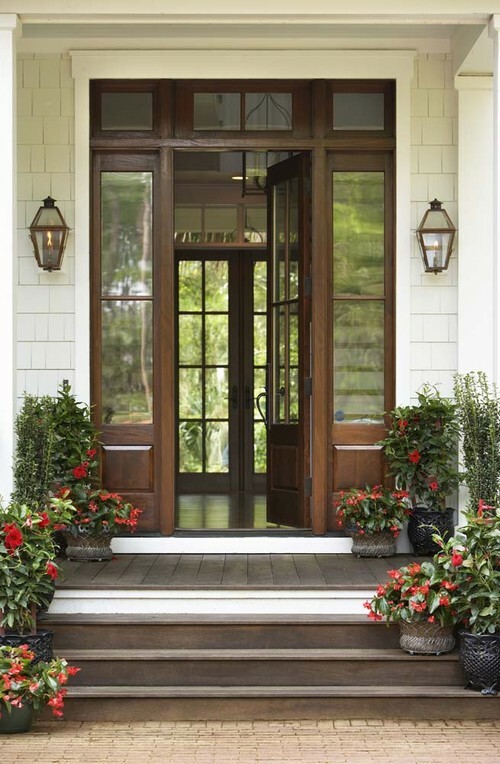 Perhaps the fastest and possibly easiest way to add instant curb appeal to your home lies right at your front door! A simple coat of paint or a minor architectural embellishment can pack a punch for making your home stand out on the block. 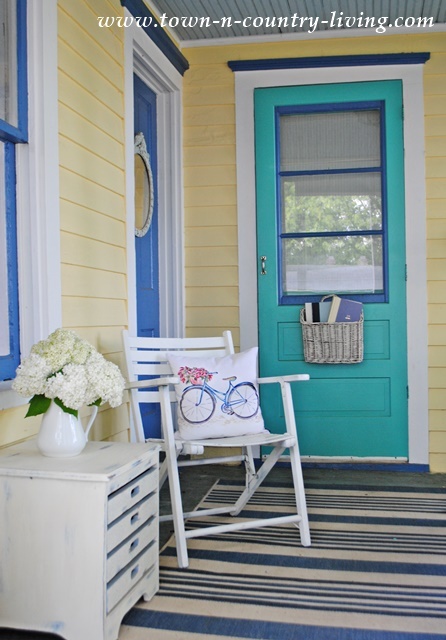 Here’s 14 charming front door ideas to get your wheels spinning. Purple? Yes, purple! Who else has a purple door on your block? Likely no one. This is such a playful hue and we recently talked about decorating with lavender this year. 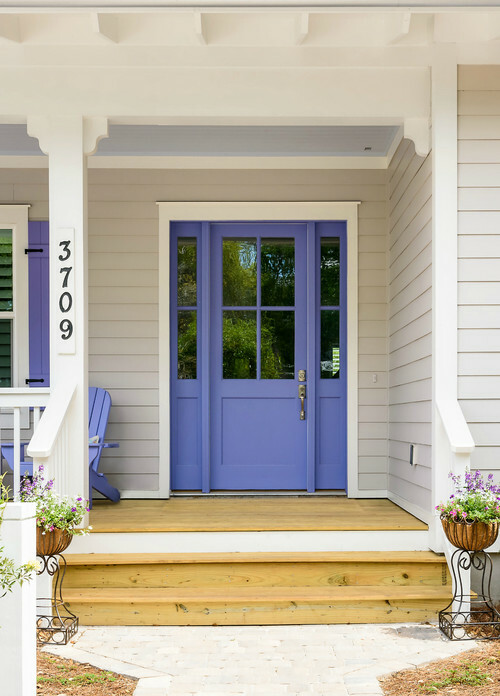 Might as well add a splash of this pretty hue to the exterior of your home, too. A sunny shade of yellow is a truly welcoming statement to friends and visitors. 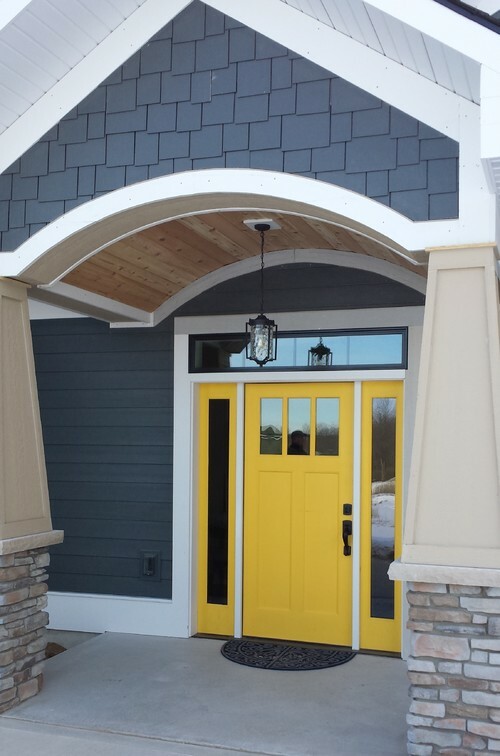 Yellow always looks great with gray, so if you’re looking for something a little less traditional, this might just be the front door color for you! Leave it natural! 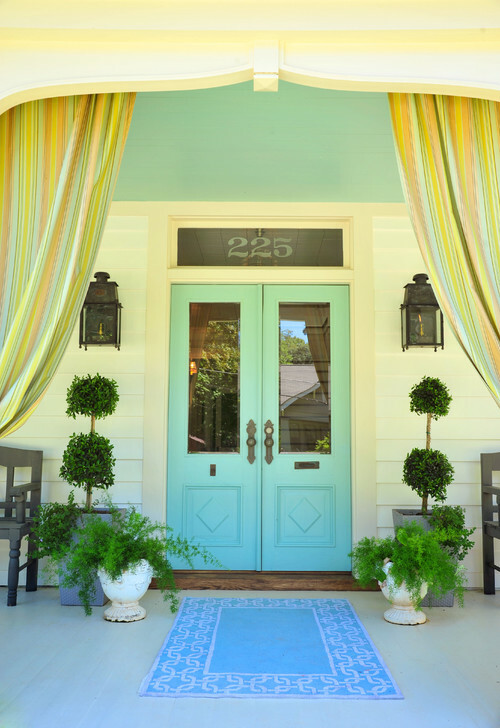 There’s nothing wrong with making a decision NOT to paint your front door. But maybe a pair of over-sized wrought iron hinges can make your door stand out a bit more. Blue is a fun color when adding curb appeal to your home. 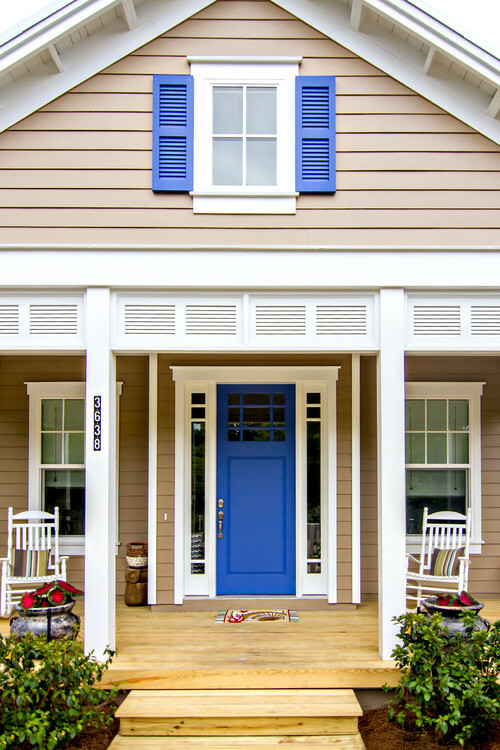 Here, shutters on a second story window match the colorful hue of the front door for a little bit bolder statement. 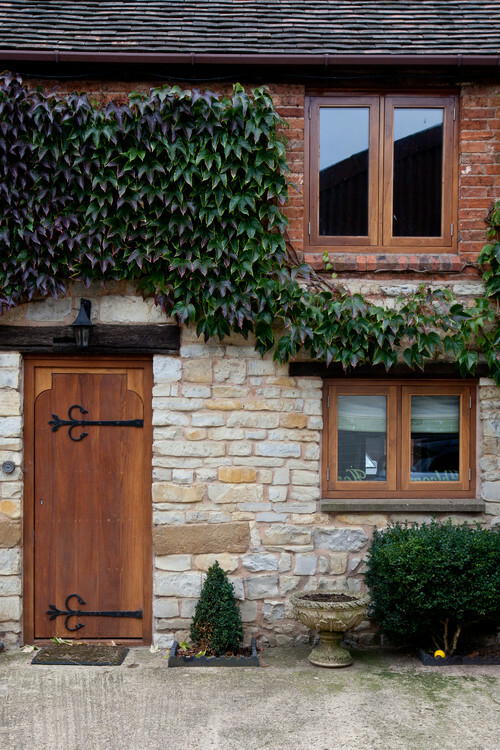 I know some people don’t like a lot of windows on the front door due to the lack of privacy it creates, but I’ve always been a huge fan of front door windows – whether it’s a pair of sidelights or on the door itself. When in doubt, go red! 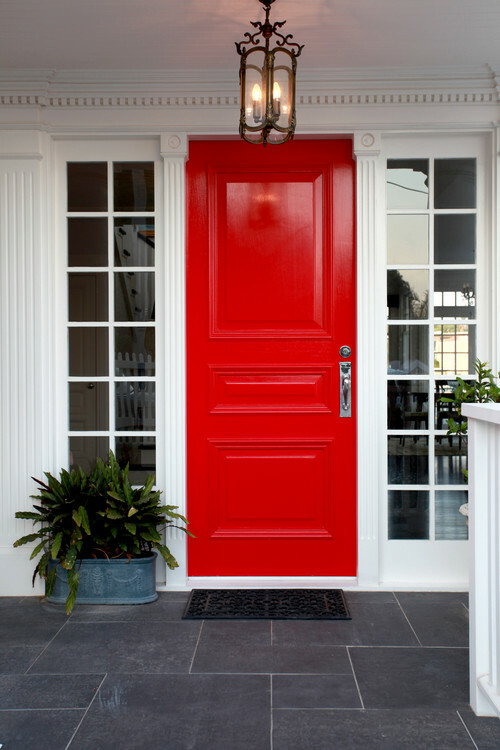 Red is a classic front door color and looks good with almost any color siding. It’s also a great color for drawing attention to the front door when your entryway might be a bit obscured by plants or trees. 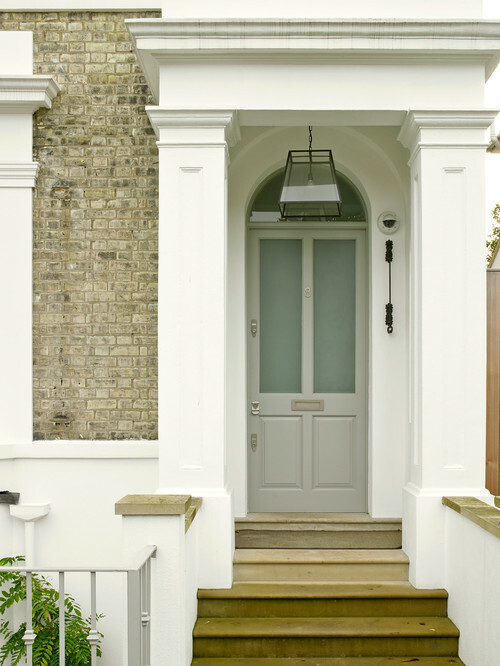 Light gray is a great front door color for those of you who prefer a softer approach to the entrance of your home. This gray door mimics some of the gray found in the brick siding. 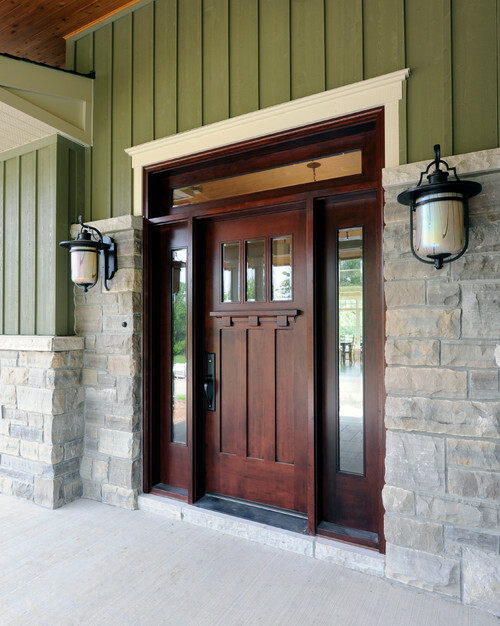 An artistic craftsman style door is always a welcome touch to a home. If your existing front door is a little lackluster, consider swapping it out for a completely new door with architectural details. 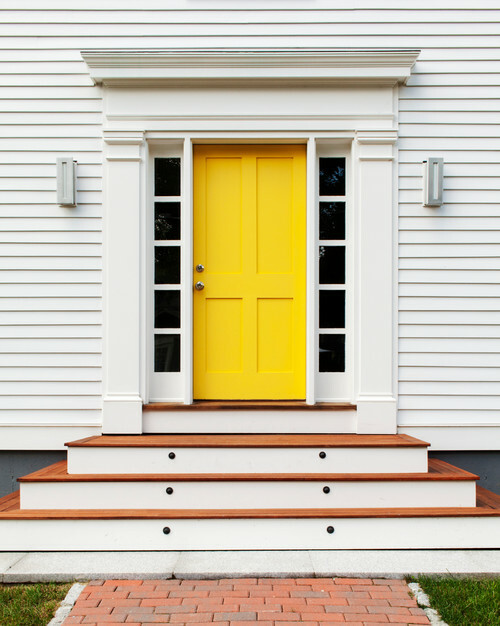 A simple entryway gets a contemporary look with a bright yellow door and sleek sconce lights. 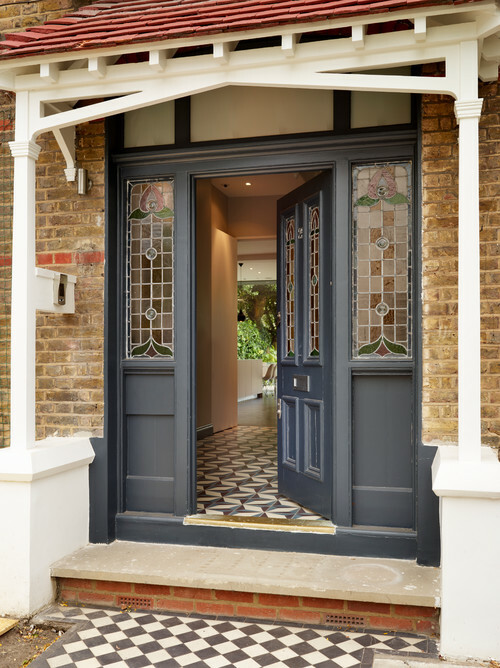 Are you one of the lucky people who enjoys a double front door? A pretty shade of robin’s egg blue is the perfect choice for this Victorian home. 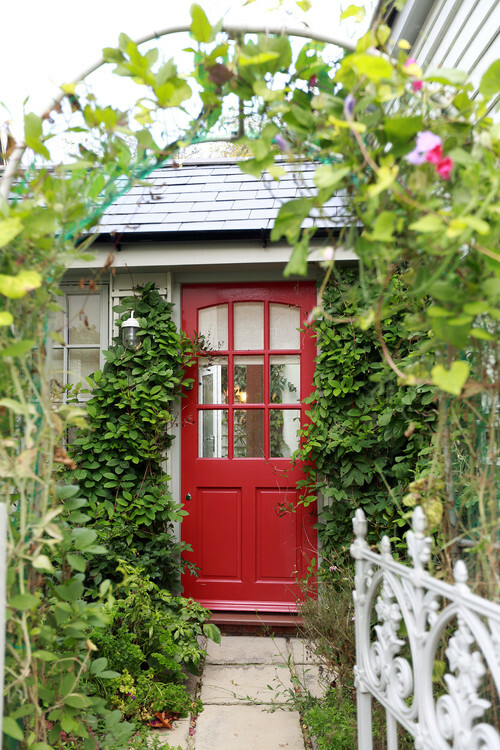 Did you know that red doors have several meanings? In America, doors were painted red to signify the home was a safe place for travelers. Some people painted their doors red when their home was paid off. In China, a red door signifies good luck. 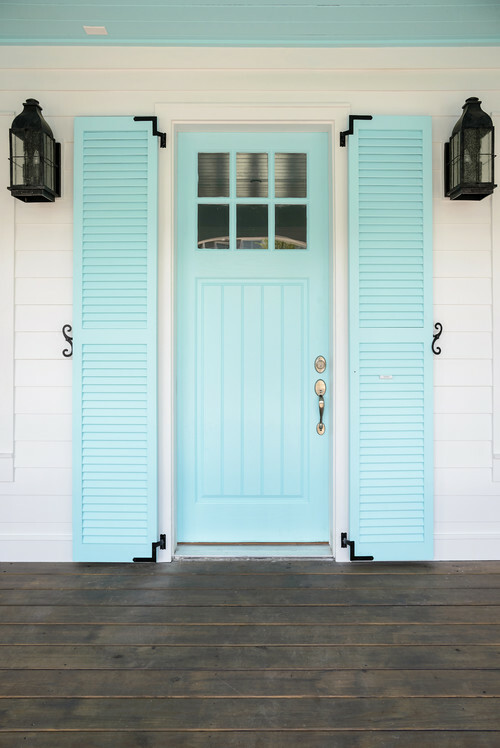 For added curb appeal, paint your porch ceiling, front door, and framing shutters all in the same shade of blue for a soft, appealing entry to your home. Don’t have front door shutters? You can always add them if you have the space. 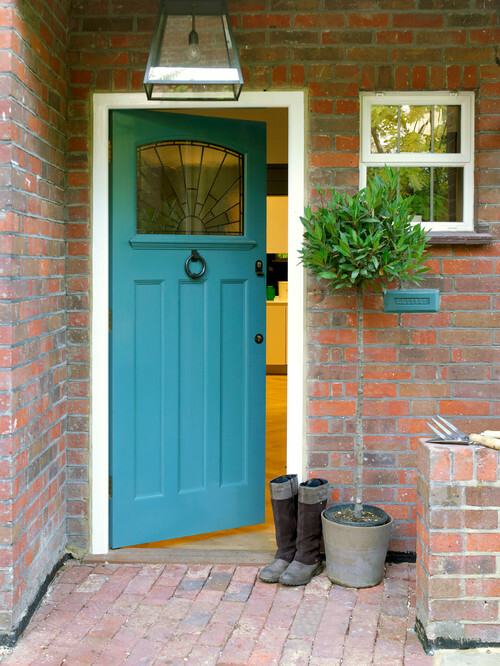 A teal-colored door with a lead glass window looks great against its red brick backdrop. I saved my favorite charming front door for last! The dark gray color lends a bit of drama to the stained glass windows and white trimmed porch. Such an elegant entryway that’s truly one of a kind! And here’s my front door. I decided to two-tone the door’s window for a unique look. A change in paint color or an architectural detail or two can really make a difference in your home’s appearance. Let me know if you decide to give your front door a make over this year! I need to paint mine but i am having a problem trying to decide on what color to choose, thanks for all these ideas. I love your door and front porch. I plan to change our front door color soon. This came at just the right time. Such fun inspiration.